Beauty in Thorns cover image. Courtesy of Penguin Random House. Kate Forsyth’s Beauty in Thorns begins with an exchange between two of the novel’s major characters – Georgiana (Georgie) Macdonald and the man she will later marry, Edward (Ned) Burne-Jones. Their conversation centres on the tale of Sleeping Beauty. The fairy story is key to Forsyth’s narrative. As the novel unfolds, Ned paints the beautiful princess over and over again. First, it is Georgie who poses as the sleeping beauty; then, Elizabeth (Lizzie) Siddal. Later still, Ned’s mistress Maria Zambaco plays the part; and, finally, his daughter Margot poses for Ned’s Briar Rose series. Women. Beauty. Art. Motifs that repeat in the novel like a William Morris wallpaper. Let’s begin with the early years of the women. Throughout their youth, three of the four main female characters in Beauty in Thorns are surrounded by privation and ugliness – in one form or another. 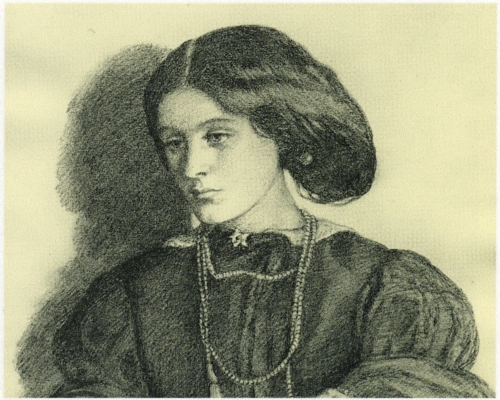 Georgie Macdonald is raised in an austere Methodist parsonage in Birmingham with ‘pyramids of slag on every corner’, where ‘even the snow felt dirty’; Lizzie Siddal comes from ‘the crowded slums of Southwark, breathing in the stench of the tanning yards every day’; Jane (Janey) Burden is a product of Oxford’s Holywell Street and St Helen’s Passage, a place that ‘oozed foul-smelling slime … so awful it was hard to walk past without gagging’. The physical environment is bad enough, but the women lack comfort in other ways. For Lizzie, providing money for her family’s survival comes at the price of working 12 hours a day, six days a week. Lizzie’s mother thinks her daughter’s notions of writing poetry and drawing pictures a waste of time and that she would be better occupied working on the state of her soul. Janey’s family support is practically non-existent. She has been a beggar on the streets from childhood, and her drunken mother is physically and verbally abusive. Janey’s prospects in adult life seem confined to earning ‘twopence for a quick screw in the alley’. But despite these unpromising beginnings, the three women come to the attention of the artists and designers involved with the Pre-Raphaelite movement. Why? Because, particularly in the case of Lizzie and Janey, they are physically beautiful. In the parlance of the day, they are ‘stunners’. The men want models for their paintings. They crave beauty. For Georgie, her ‘beauty’ in Ned’s eyes is also bound up with her youth – the pair are engaged when Georgie is 15 and Ned is in his early 20s. In Forsyth’s novel, Ned resists women growing to maturity. He is saddened when Georgie’s younger sisters pass through girlhood, and he will come to resent signs of womanhood in his daughter Margot (the fourth member of Beauty in Thorns’ female quartet). The beauty of the women translates itself into the art of the men. And, perhaps because the men saw no distinction between art and life, the women become wives. 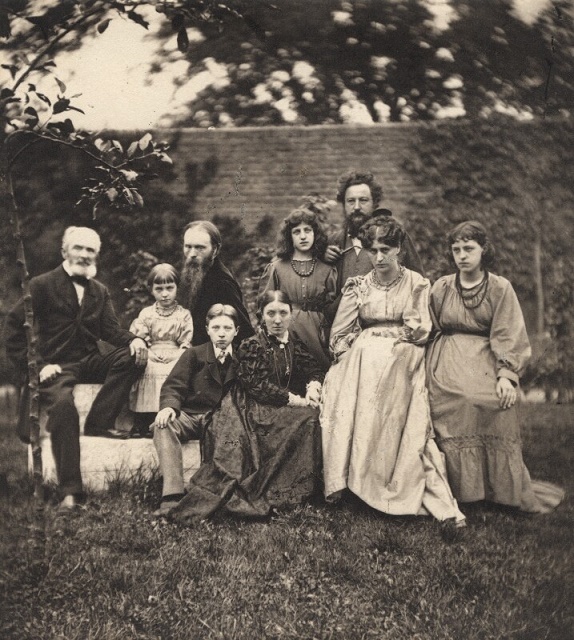 In close succession, Janey marries textile designer William Morris (26 April 1859), Lizzie weds a reluctant Dante Gabriel Rossetti (23 May 1860), and Georgie pledges her troth to Ned Burne-Jones (9 June 1860) – a promise not faithfully reciprocated. My sense, formed from reading Forsyth’s richly researched work of fiction, is that Gabriel’s love of beauty is based in the physicality and sensuousness of the female form. He is captive to it. When he first meets Janey in Oxford, he says: ‘You are the most beautiful girl I have ever seen. I must paint you.’ And he tells Lizzie: ‘I almost afraid of trying to paint you … How can I catch all this beauty?’ His series of affairs with his models suggests he was not so afraid as to stop trying. I intend to spend the rest of my life loving beauty with all my heart … I like beauty … I want to make things beautiful. I have no politics, and no party, and no particular hope. I only know that beauty is very beautiful, and softens and comforts and inspires and rouses and lifts up and never fails. Original design for ‘Trellis’ wallpaper, 1862. William Morris. 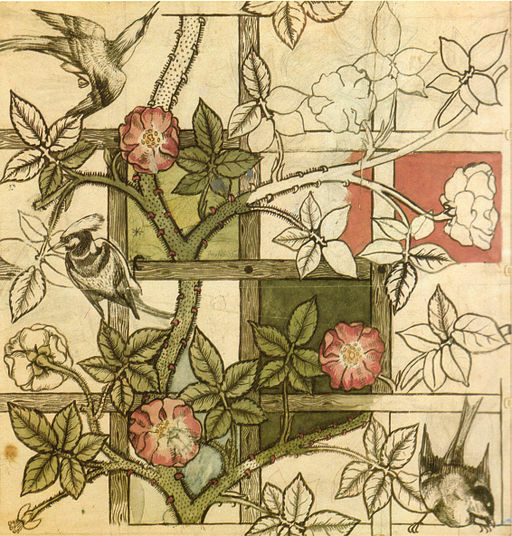 ‘Trellis’ was Morris’s first wallpaper design. It was inspired by the garden at the Red House. As I read Beauty in Thorns, I began to wonder whether the male artists were seeking to transfer beauty into a static form, while the women – seeking beauty in equal measure – wanted to be awakened to it. It’s the difference between fixing and releasing. Did the painterly princes merely want to awaken beauty in order to claim it for themselves? Did their princesses, instead, want to cease being an object in another’s life and become the subject of their own? Except for the extract from Georgie Burne-Jones’s Memorials of Edward Burne-Jones, all quotes in this post are from Kate Forsyth’s Beauty in Thorns. 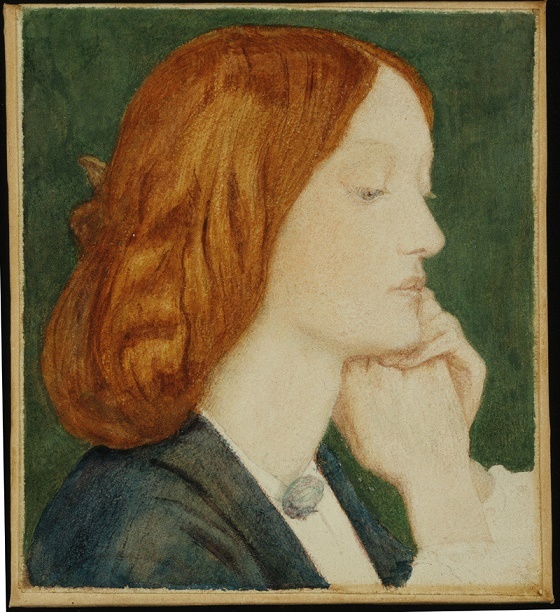 The words attributed to the Reverend George Browne Macdonald, Dante Gabriel Rossetti, Ned Burne-Jones and William Morris are Forsyth’s creation. I have based my own opinions of the men’s characters and perspectives on her interpretations. Details of names, marriages, and the construction of the Red House are factual. Forsyth, Kate. Beauty in Thorns. North Sydney, NSW: Penguin Random House. Australia, 2017. Penguin Random House’s website has several resources relating to Beauty in Thorns including an extract and book club notes. Kate Forsyth’s website and blog provide ample further reading for those wanting to explore the stories behind the novel. On YouTube and Pinterest, you can see Forsyth’s creative process for the novel unfold. Burne-Jones, Georgiana. Memorials of Edward Burne-Jones. London: Macmillan, 1904. William Morris’s Red House in Bexleyheath is now a National Trust property. Details here. To discover more about the women mentioned in this post, visit The Pre-Raphaelite Sisterhood website. A useful source of information for Edward Burne-Jones and Dante Gabriel Rossetti is Art UK, and for William Morris, visit the Victoria and Albert Museum website. 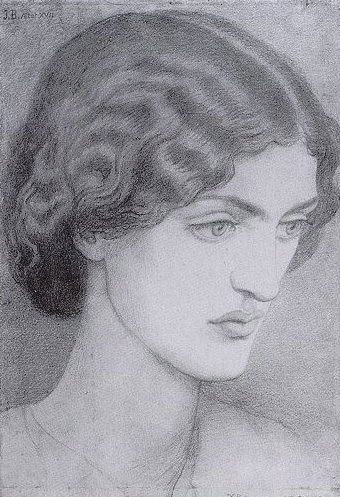 There are wonderful examples of Burne-Jones’s, Rossetti’s, Morris’s art on the Tate website. You will see Janey Burden, as in Prosperpine (below), re-created in the work of each artist.